A collection of movies dealing with life after a deadly epidemic. These are stories of grit, survival and the occasional heart-skipping scare. Includes some obvious choices and some obscure ones. Despite feeling like a breathless tale from the mind of an super imaginative youngster, Pandorum manages to tell a tale of apocalypse, horror, bravery and hope. All the while masquerading as a scifi flick. For the majority of the movie, things happen. Characters come and go, violently. Story is revealed, twisted, hidden and revealed again. And there is a nice quest built into the movie that arcs across the storyline, making this feel, at times, like a space-age Indiana Jones episode. 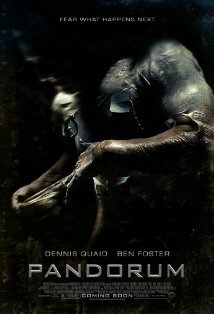 Pandorum is a quintessential post-apocalytic movie, set in a space-ship at the end of human life on earth. In addition to a gritty bleak setting and scary creatures in the shadows, the movie explores the ability of the human race to survive - not matter how great the cost. Carriers is one of the tamest Zombie movies, if you could even call it that. It is a slow and haunting exploration of survival after a viral apocalypse. Centered around two brothers, and their search for a childhood paradise, Carriers is both noble in it's honesty and profound in its selfishness. The undead of this movie are not animated corpses; instead they are pathetic survivalists united by their unwavering capacity to be infected without recourse. Two brothers and their girl friends are escaping a world-wide epidemic of an infectious and deadly virus. Their path to survival is based on strict rules - to never come in contact with other infected people. No matter what happens and who the infected may be. When one of them becomes infected with the deadly virus, the resolve of the group in following the rules is painfully tested. It is a simple premise with a heart warming execution. 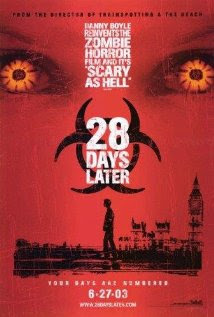 What I am Legend is to New York City, 28 Days Later is to London and all of Great Britain. One of those sublime opportunities to see parts of UK completely uninhabited. Animal rights activists attack a secret Government testing facility, releasing chimpanzees infected with a highly communicable viral disease. In a cruel twist of massive irony, this releases the deadly virus into the open ravaging UK over a period of 28 days, killing most people and leaving a few ravenously hungry for human flesh. As with the rest of the movies on this list, the story is ultimately about survival - in all its myriad forms. And it is also a story of bravery, and valuing others more than one self. 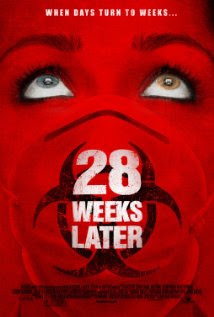 28 weeks later is the sequel to the more famous 2002 movie - 28 days later. As it turns out, during the initial disaster of the rage virus, Don and his wife Alice try to survive by locking themselves in their own house. When the infected attack and are able to overpower the defenses, Don escapes leaving Alice behind. Six months after the infection, a NATO army has secured parts of London to set up base for uninfected English citizens to return and repopulate the country. Don and Alice's children return from their vacation in Spain, but escape the security perimeter to retrieve personal possessions from their home. To their surprise they discover a delirious but living Alice. Their joy turns out to be short lived, as the virus seemingly is not fully extinct yet. The Crazies is post-apocalyptic, not for the entire world but for an unfortunate town in Iowa, that receives a unexpected dose of toxins from a plane crash. As residents begin to turn into violent psychopaths, the Sheriff David (Timothy Olyphant) has to rally the survivors to fight, while trying to figure out what really went wrong. The movie has elements of the expected Government conspiracy, nicely intertwined with human monsters and a quest for survival. By setting up the conflict between the innocent and powerless townsfolk and the big bad Government that only wants to weaponize deadly viruses, the stage is all too predictable. What makes the movie different is it's merciless cinematography. There are no long eulogies or subtle point making. Just a frenzied will to escape and survive. 12 Monkeys is a scintillating science fiction story, of improbable actions and personal demons. But first and foremost, it is a post-apocalyptic survival movie. A man-made virus, released deliberately in several locations across the world, has destroyed a large part of human civilizations. The survivors have gone underground, but yearn to return to the surface. When they develop time-travel, such an opportunity presents itself. 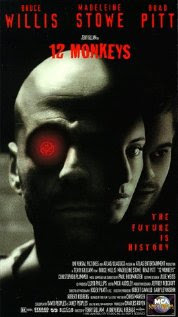 James Cole (Bruce Willis) is a disturbed prisoner, who is chosen to go back in time to just before the world-wide epidemic and track down the group calling itself "The Army of 12 Monkeys", which is believed to be responsible for the disaster. Cole survives multiple attempts at time travel and eventually reaches the correct time period; while his inner demons have grown more vociferous. As he begins to learn more about himself and the 12 monkeys, he also realizes that there is more to the mission than his briefing. An atmospheric whodunit set against an inevitable mass extinction. I am Legend is probably the most expected movie on this list. 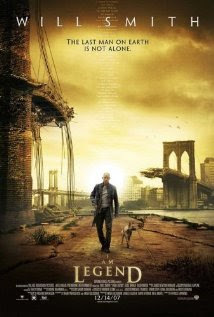 When a plague destroys most in New York and turns the rest into sunlight-hating blood-thirsty monsters, Robert Neville (Will Smith) and his faithful dog are determined to keep their sanity and lives. Following a strict survival regimen, they roam the eerily empty streets of the city during day, and retire to a fortified house to survive the night. The plan seems to be working, giving Neville time to work on a vaccine for the infected. Till one day he is caught in a trap, sprung by the infected who are waiting in the shadows for darkness so they can get their hands on him. Even though unexpected help shows up in the form of a traveling Anna (Alice Braga), Neville has to decide between pursuing his tentative search for a vaccine and fighting for his humanity one last time. This is not the first attempt at making the original book into a movie, but for those of you who have not read the book; the movie is not a bad way to start thinking about living alone in New York City. After a devastating war between machines and humans, all humans are seemingly destroyed. A rag doll named 9 comes to life. After being attacked by a machine called the Beast, 9 meets others like him, numbered rag dolls that are able to survive the wrath of the machines by hiding and sneaking around. When 2 is taken by the Beast, 9 organizes the remaining rag dolls on a daring and desperate attempt at rescue. As the rag dolls organize themselves and begin to fight the machines, they realize that they are also carrying precious cargo, that could hold the key to human salvation. 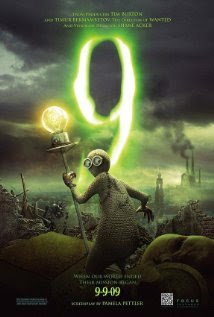 9 is a stylistic look at a post-apocalyptic life, without humans. But the rag dolls are, unbeknownst to them, more human than they realize. The list is obviously missing two mainstream movie series - the Matrix trilogy and the Terminator quadrilogy. For obvious reasons - they are among the most well known movies of this genre and I'll not add much by including them to this list. You've either seen them, or this genre is probably not of much interest to you. There you are - 8 movies with the best advice on what to do when the world ends tomorrow.